Locked out of your car, need a replacement car key or a replacement key fob? Our 24/7 licensed, trained, bonded and insured automotive locksmiths will come to you at work, home, the office or your kids school to get you back up and running as soon as possible. You can also visit us at our location in Summerlin, Nevada off of Fort Apache and W Twain Ave.
Did you loose your car keys or need a second set for the nanny, a family member or just because? Our mobile automotive technicians will come to you where ever you are in the Las Vegas, Summerlin or Henderson area. There’s no need to go running around, let us come to you. Did you lock your keys in your car? It happens to the best of us at the worst possible moments. Our mobile automotive locksmiths will come to you at any time of the day or night to get you back into your car and back on the road as soon as possible. Did your car key get locked in the ignition or your door? 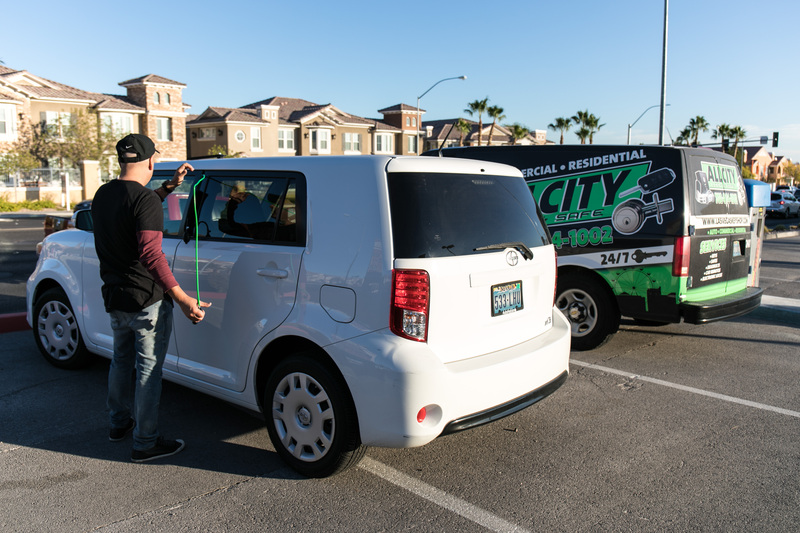 Our licensed, bonded and insured technicians are readily available and stationed in our All City vans around Vegas and will come to you to extract the key out of the car, create a duplicate so you can get back to what you were doing as soon as possible. Loosing your key fob is the worst and the car dealerships will charge you an arm and a leg to get them replaced. Our mobile technicians and in-store staff will help you get ANY new fob ordered, programmed and cut if you have a valet or other key that we can duplicate. Don’t pay dealership prices, come to us and we will have this done day of if we have your part in stock. Not only can we replace car ignition and door key and fobs, we also can replace or duplicate your motorcycle ignition key. Contact us today for a quote or to schedule an appointment. You can also visit our location in Summerlin during normal business hours. Is your car lock itself broken? Our mobile automotive locksmiths can come to you (Las Vegas Strip, Henderson, and Summerlin) and we will do our best to get into your lock and get it repaired. We also can do this service at our Summerlin location off of Fort Apache and W. Twain Ave.
Do you need to have a high security automotive key programmed or duplicated? All of our mobile and in-store locksmiths can duplicate or program any high-security car key in-house without the price-point of the dealership. All City Locksmith is your one-stop source for all your auto, commercial and residential needs 24 hours a day, 7 days a week. We have technicians that will come to you or you can visit our location in Summerlin, Nevada. Subscribe to our monthly email for special offers and updates! Copyright © 2017 All City Locksmith - Vegas. All rights reserved.